While I was transplanting seedlings, a little centipede (I guess) crawled out of the soil of one. He was about the color of my rice hulls, but a little longer and skinnier and of course with a bunch of legs and moving. I wasn't sure if he counted as good guy or bad guy. I keep a bag next to my seedling counter for compostable waste (culled seedlings, all the spilled potting mix that gets wiped up, etc), so I just tossed him in there. It was my compromise position: I didn't kill it, but I didn't leave it in with my plants either. Now I keep looking closely at all the rice hulls in my potting mix, to make sure they aren't walking around! Re: good guy or bad guy? Depends on whether it was a millipede or a centipede. Typically but not always, millipedes have rounded back and centipedes have flat back. Centipedes are predators and will eat pest soil denizens including fungus gnat larvae, slug and snail eggs, but also earthworm eggs and beneficial as well as detrimental nematodes. Millipedes are detrivores and will eat fungi but will also eat young root hairs and roots as well as seedlings. So compost bin is a good place for it. It is best to be cautious, RainbowGardener. 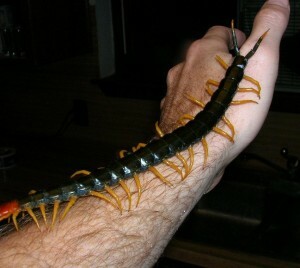 I don't really have any knowledge about centipedes. There sure are a lot of them here! They are in our evergreen forests, under every rotten log. They are in my greenhouse right now, under anything left on the floor. Maybe, centipedes are why I don't have earwigs in the greenhouse. Hope so. I wonder if they keep the aphid population down. Maybe I need more! Now, you are probably not dealing with a Symphylans, right? (LINK) I've never noticed them in my potting soil but they will show up in my cabbage family veggies, in the roots and it's not good . I never see them by themselves. They are barely mobile. Not so with the real centipedes. Scurry and hide! That's okay ... as long as they don't try to hide in my shoe. In looking it up, I also had to see some horrifying images, that will probably give me nightmares tonight, e.g. I had about a dozen little tomato and pepper seedlings just up and die on me, which hasn't happened for years. I don't think it was damping off, they didn't lean over or lie flat and there was no pinching in at the stem base. They just sat there and shriveled and yellowed. But when I pulled them, I discovered they had NO root system left. These were all seedlings that had been transplanted from being very crowded to one per cell, so I know at the time I transplanted them, not all that long ago, they had good roots. I haven't seen any sign of fungus gnats and I do the cinnamon all the time. What else attacks the roots like that? Could it be the millipede? I got rid of the one I saw in the compost and have not seen any more. I will have to dig around in the soil, see if I see anything else. Centipedes like compost piles and mulch. It is a nice warm place to lay eggs in. Normally they do not attack unless they are provoked and would rather scamper away into another dark place. They do eat small bugs in the pile. Actually the older and bigger ones are more lethargic and are less likely to pinch and sting you. Smaller ones are more active and are more likely to attack if anyone tries to grab them. They do have the creep factor though and I do not want them in my house, that is why I don't bring home any mulch and I buy bagged compost. There are actually worse things in a compost pile, spiders, ants, roaches, pillbugs, mealy bugs, scorpions, and sometime mice. We caught a 36 inch long one once. You have 36 inch long centipedes? I went back over your compost denizen list to see if you mentioned SNAKES. imafan26 wrote: We caught a 36 inch long one once. Anyone know what this fly (?) is -- good or bad?